After a successful trial at Oldham Athletic, PSV youth academy product Stefan Stam signed a contract until the end of the season in February 2005. At the end of his successful short period, he signed a two-year contract with the Latics. The Dutch defender has made only 14 appearances for the Latics in the 2005-06 season due to a succession of injuries. Stam struggled with knee and hamstring injuries earlier in the season and then underwent surgery to resolve a hernia problem. Stam made a strong start to Athletics 2006-07 campaign, but again struggled with injury and finished the season having appeared 25 times (1 goal). But he put his injuries behind him to clock up a career-high 41 appearances in 2007-08. Stam was a popular figure around the Latics and provided additional experience in the centre or on the left side of defence. However in May 2009 Stam was released by Oldham. The 29-year-old former Eindhoven player made 102 appearances during five injury-plagued seasons with the Latics. The League One outfit had announced that Stam had been released after failing to show up for contract talks with manager Dave Penney. Soon after the announcement, Oldham have apologised to the player, stating his departure is purely for footballing reasons. On the 26th of June 2009 Yeovil signed Stefan Stam on a two-year deal. In the 2009-10 season, Stam featured just 18 times in the League, scoring once. At the end of March 2011, Hereford United have signed Yeovil Town defender Stefan Stam on an initial one-month loan deal. Stam has made just 21 league appearances since joining the Glovers in July 2009, scoring once. He has not featured for Yeovils first team since November 2010. 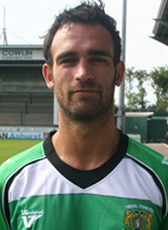 In July 2011 Hereford have completed the siging of Yeovil defender Stefan Stam on a permanent two-year contract until 2013. Stam played most of the matches in the Conference League. At the end of his contract he returned home. Stam signed a one season deal at FC Den Bosch until June 2014. He joined Topklasse club Katwijk for the 2014-15 season when his contract expired at Den Bosch. In December 2014 his contract at Katwijk was renewed with one more season. In the 2016-17 season, Stam was playing in the Tweede Divisie (3rd tier) with Katwijk. It was his final semi-professional football adventure before his retirement.